The Minor Family Album closes with nine children’s portraits, all of them, but one, local Green County kids photographed by Carmichaels (Pennsylvania) portrait expert, Thomas W. Rogers. The exception is found in page twenty-three’s head shot of a young girl, taken by Iowan Silas T. Wiggins of Cedar Rapids, in the early eighteen nineties. To distinguish his work from the other photographers of Linn County, Mr. Wiggins used ivory colored cardstock with rounded corners and gold beveled edges. A thin brown line borders all four sides, just a hair away from the cabinet card edge, framing both the portrait and Silas Wiggins’ imprint. That much embellishment was used by many photographers in the years between 1889-1894, however. What sets this card apart is the imprint’s logo which, together with the text, describes Silas T. Wiggins in quite some detail. Cabinet Card Imprint, Silas T. Wiggins, photographer, Cedar Rapids, Iowa, 1889-1994, Unidentified Girl, Minor Family Album, p. 23. Author’s Collection. Upon first examination, this artifact appeared to be a typical Victorian business card incorporated into a commissioned product; S. T. Wiggins was the creator of the cabinet portrait, and could be found in a studio near the post office in Cedar Rapids, Iowa. There is something about the coat of arms and the scrolled design that makes me pronounce this information with a flourish, a reaction that I have not had to any other cabinet card imprint. Questions bubbled up in quick succession…what are those groups of letters? that crown thingie? What is the meaning of the circle? What is inside the square? This Anglo-Norman phrase–Evil unto him who thinks evil of it–is the motto of the British chivalric Order of the Garter. At some time in the past few hundred years, this order became associated with Freemasonry. The words are printed on a garter, which encircles a shield on which are displayed a lion and a harp. Atop this emblem sits a crown. 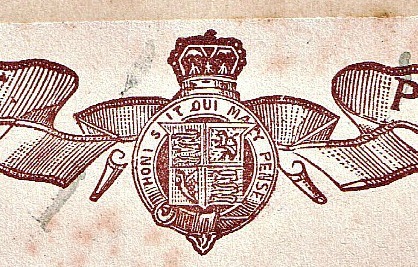 The medallion in the Wiggins’ imprint is filled with the symbolism of Freemasonry. A biography of Silas Wiggins in the History of Linn County, Iowa* confirmed that the photographer had been a Mason, and served as Sir Knight Templar and in the Apollo Commandery. Freemason membership was important to Silas Wiggins, and from a cursory look at the rest of the Brewer book it would appear that freemasonry was important to much of Linn County’s leadership. Is it possible that Silas Wiggins included the masonic symbols in his professional imprint to advertise specifically to fellow freemasons? Did that membership drive business into his studio? I suggest the answer is yes. At least on one occasion. The women with a masonic affiliation could join the Order of the Eastern Star, whose emblem was a richly decorated five pointed star. Each point held a symbol representative of a Biblical queen and a virtue for which she was known. For example, a scepter and crown represented Esther and the virtue of loyalty. A scepter and crown, like the one seen in this young girl’s necklace. 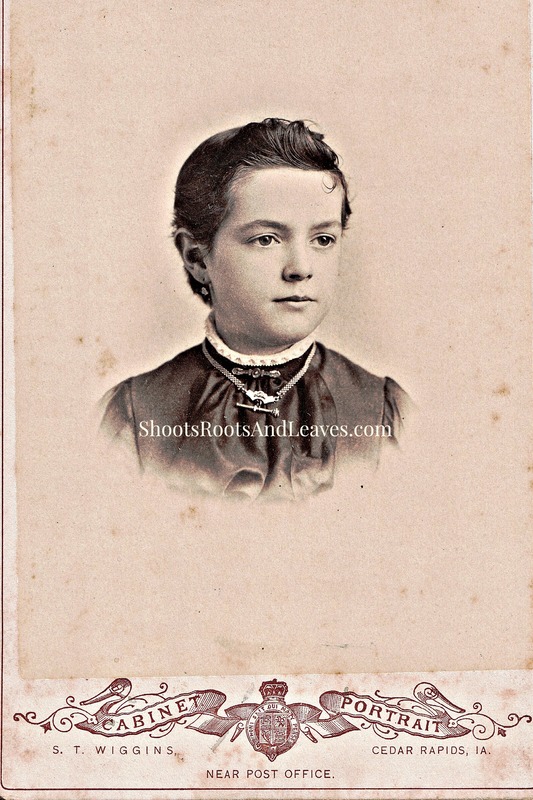 Unidentified girl, Silas T. Wiggins, photographer, Cedar Rapids, Iowa, 1890-1892; Minor Family Album, p. 23: Author’s Collection. *Brewer, Luther A. and Barthinius Wick. The History of Linn County, Iowa, Volume 2, p. 233. The Pioneer Publishing Company: Chicago. 1910. Photograph by Thomas W. Rogers, 1888-1890. From the Minor Family Album, archives of the author. Page fifteen of the Minor Family Album holds this photograph of a middle-aged man. Shot sometime between 1888 and 1890, this portrait is yet one more mystery. An 1874 family photograph, however, has a person that is eerily similar to this guy, and on that bit of evidence I advance the likely identification of John Pierson Minor. John was born seventeen years before my great-grandfather, Robert, in 1852, to Marion and Mary Jane Guynn Minor, just outside the village of Garards Fort (Pennsylvania). Folks in the surrounding hills admired and respected the stock driving, enterprising man for whom he was named–grandpa John Pierson Minor. 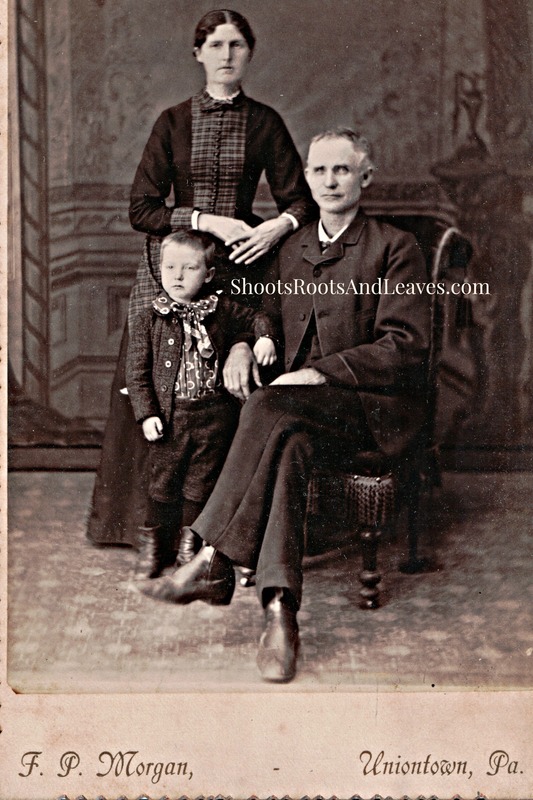 And by the time this photograph was taken, young John had established his own reputation as a cattle dealer and farmer. What is most fascinating about this artifact is what is NOT there…his wife and baby. The cabinet card is not quite as sturdy as one would expect from an established photographer like Benjamin E. Goldsberry, and his studio logo was stamped in haste across the bottom, leaving the green-inked words crookedly confirming the man’s location–Court Avenue in Bedford, the county seat of Taylor County, Iowa. Ben Goldsberry operated cameras like an artist and had a strong reputation in the region, training other aspiring photographers like Matthew G. Maxwell. The young couple wear clothes that are simple and traditional, probably made of worsted wool. The woman’s bodice is plain with no inlays, embroidery or ruffles, and the buttons appear to be made of bone. She dresses the outfit up with a starched undercollar and a beautiful oval broach at the throat. Her hair is divided in three pieces; the bottom strands are pulled to the back and twisted into a bun, which is then wound with the two upper pieces for an 1880s finishing touch. The man wears a jacket and vest made of matching plaid fabric, and a long flowing beard with trimmed sideburns and mustache–a style considered old-fashioned back east. Mr. Goldsberry operated his Bedford studio from 1880-1890, and these internal clues suggest that the couple posed on Court Avenue between 1884-1889. I have uncovered six Minor family members living in Iowa’s southcentral counties during the latter decades of the 19th century so far, and only one would fit the description above. John P. Keenan was born on a farm near Carmichaels, Pennsylvania, son of Hugh and Isabella Minor Keenan. An adventurous person, John left Greene County in 1875, and as an eighteen year old made his way to Taylor County, Iowa, where he herded other people’s cattle for a living. He was an enterprising man known as a progressive farmer. By 1881 John was acting as the legal agent for his Uncle Marion Minor, collecting “judgements” from other Greene County residents who had borrowed money to establish their Iowa roots. During this same time period, John had made enough money to purchase his own farm in the neighboring Ringgold County. There he met, courted and married Minnie Norton in 1884. By 1887 John and Minnie had the opportunity to purchase 300 acres of fine farming land south of Mormontown (Blockton), Jefferson Township, Taylor County. Their lives were turned topsy-turvy when son Hugh was born the summer of 1887. Unfortunately the following year was filled with grief, as they lost first Minnie’s father, Martin, and then their little boy. Perhaps later that fall the young farmers headed to town, purchasing winter supplies, tying up financial matters, posting letters before the winter storms set in, and stopping by Court Avenue to document their resilience for posterity.